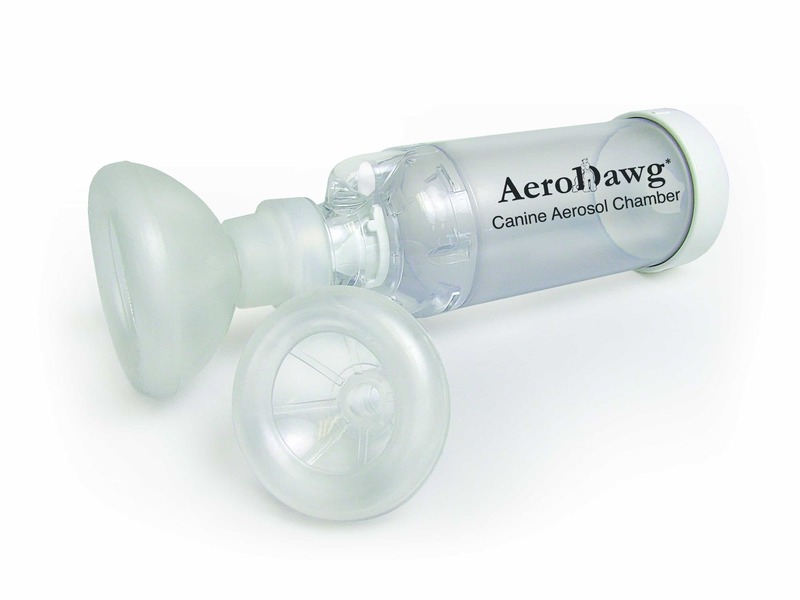 Light weight, uni-nostril Metred Dose Inhaler (MDI) coupling chamber for dogs. Chronic bronchitis is one of the most common respiratory diseases in dogs, but is difficult to diagnose as it can mimic other pathologies. Dogs which experience chronic inflammation are often sensitive to environmental and household allergens. Gagging or swallowing after coughing. Wheezing for a duration of 2-3 months or longer. Target specific lung delivery of medication. Controls and alleviates airway inflammation and airway obstruction. Patented ‘Flow-Vu’ indicator enables accurate counting of inhalations. Exhalation valve directs the flow of air away from your dog to prevent irritation. Two mask sizes to accommodate all breeds and sizes of dogs. Accurate directing of aerosolized pharmaceuticals to the lungs and small airways. Improved drug safety and efficacy by reducing total therapeutic dose required. Reduces the risk of side effects and stresses associated with pills, syrups or injections. Unique, durable, anti-static polymer chamber with flexible nostril cup. Able to be used as the coupling device for aerosolized MDI’s. By depressing the MDI, aerosolized particles are delivered into the chamber and inhaled. Gently apply the mask to one nostril and upon inhalation, the ‘Flow-Vu’ indicator will flutter toward the dog signaling inhalation. AeroDawg* Small Chamber is shipped with 2 different sized facemasks (3.2cm & 3.9cm diameter). AeroDawg* Large Chamber is shipped with 2 different sized facemasks (3.9cm & 4.7cm diameter).